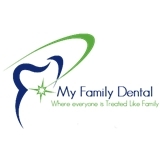 My Family Dental (Fort Worth) - Book Appointment Online! Gentle, Caring Professional Staff, Making you feel right at home. We provide treatment using the best, highest quality materials. Prouldy Serving the Fort Worth Area!